While I’m not one of those people who go crazy for Halloween, I’m a subtle fan. I love getting together with friends and watching cheesy horror movies, carving jack-o-lanterns and walking around the neighbourhood seeing all the kids trick or treating. But this year, I decided to take things up a notch. 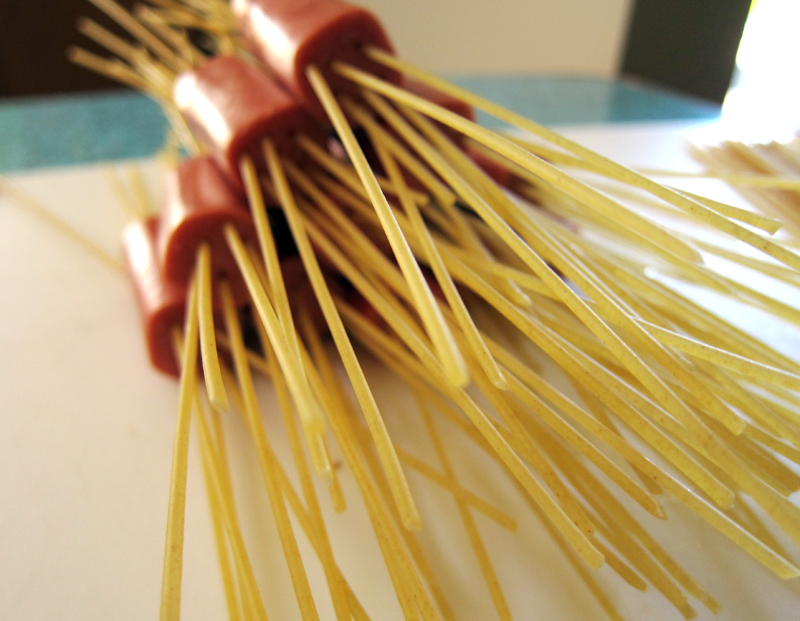 Hot dogs meet spaghettini. 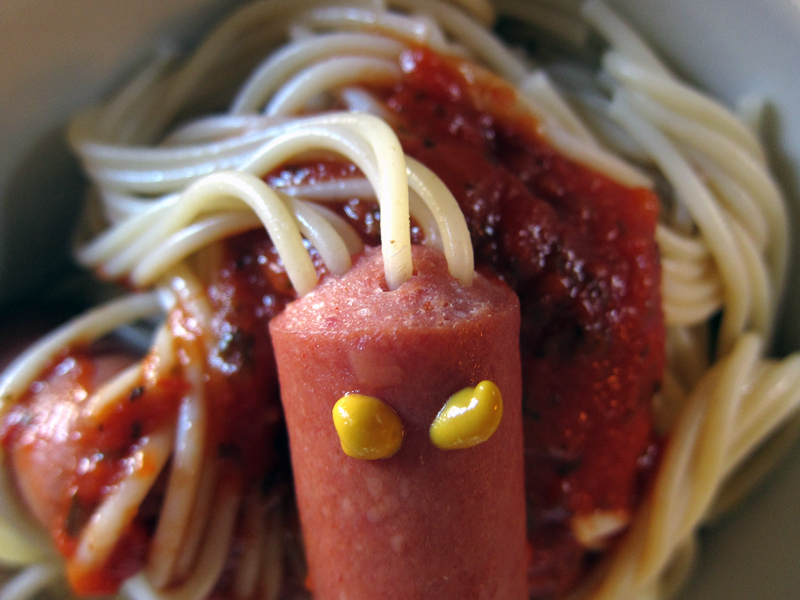 Creature From The Spaghetti Pot!!! A few years ago I spotted this idea on some random blog. 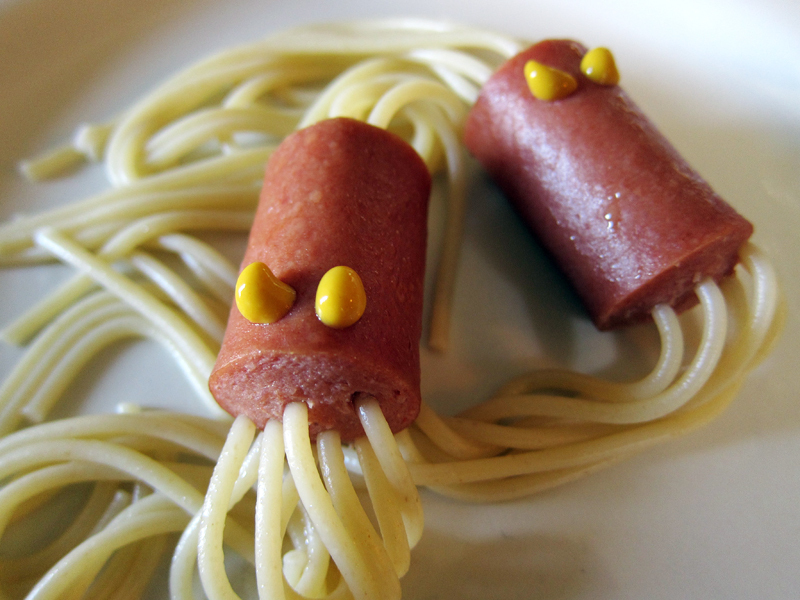 Then a few weeks ago, Tara from Tea & Cookies, tweeted about these creepy weenies and reminded me about how much fun it can be to play with your food. Idea + Halloween, hello?! So I got to it. I used spaghettini but angel hair pasta would be good too – plain old spaghetti could be too thick and take too long to cook – the noodles packed into the dogs are a bit chewier than the free-floating spaghetti “legs”. It’s easy, a little bit frightening and totally fun. I served these at lunch and the consensus was that this wasn’t just lunch, it was a special surprise. We don’t have kids, but it’s nice to feed your inner childhood goofball. Add your favorite sauce. Dot some eyeballs with mustard. Drizzle with pesto for an eerie creepy hue. It’s a heck of a lot of fun. Boo! elsewhere: Want something a bit less goofy? Jump over to Poppytalk and take a bite out of these coffee-shop worthy cherry & dark chocolate scones. 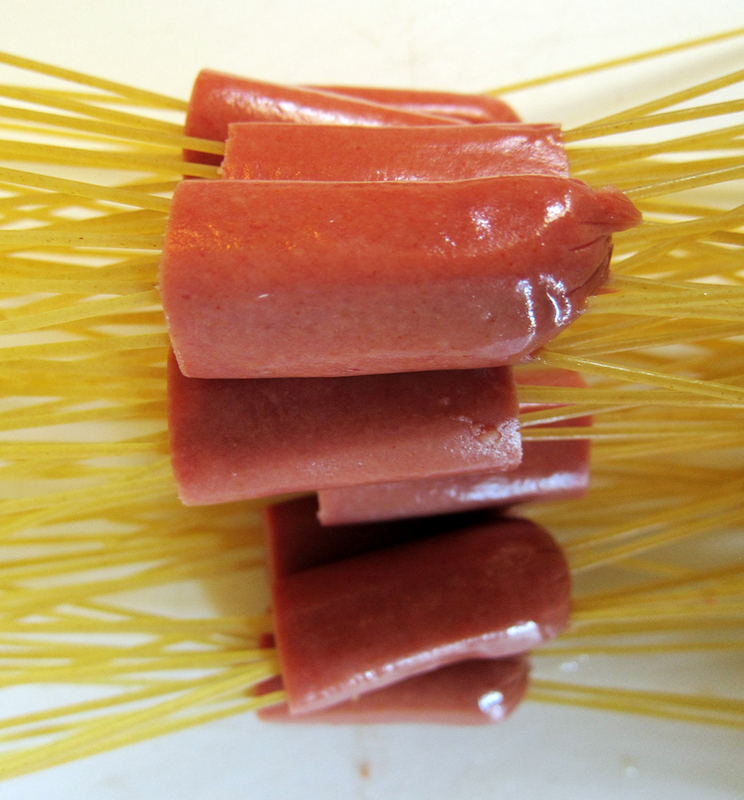 Poke pasta into hot dog pieces. Fill a large (deep & wide) pot with water and bring to a boil. 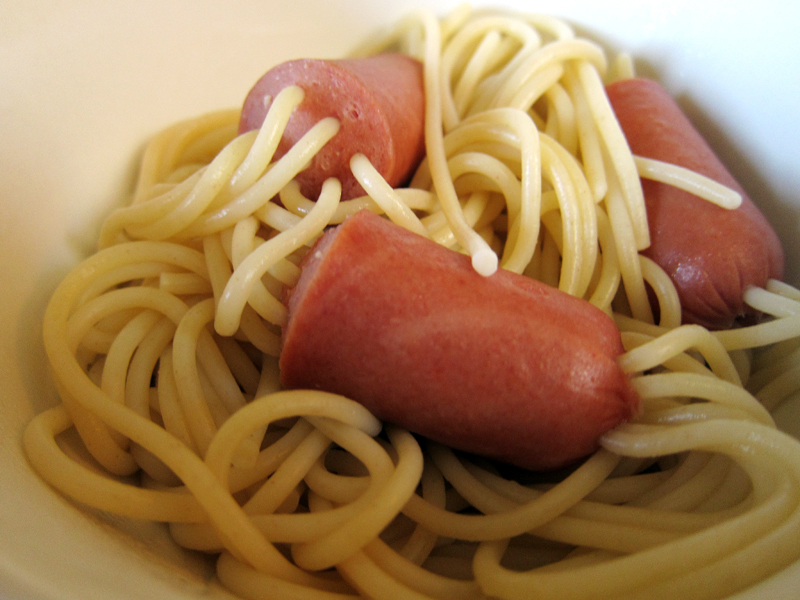 Add the hot dog creatures into the boiling water and cook until pasta is done. Play with your condiments and play with your food. 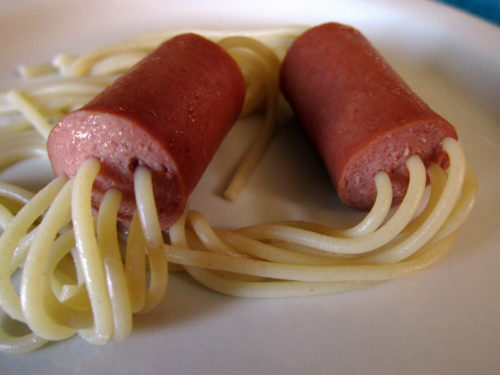 Creepy eats! « roasted veggie enchilagnas?! why not! Very cool! I wonder what other animals your creatures you could make with this method? Thanks vanillasugarb 🙂 I’ll go with cute too! Bunny, give it a try & if you come up with something interesting, let me know! Joanne, cool, cute & terrifying?! Ha. These are adorable! I would have never thought to do this, but it’s SUCH a great idea! I’ve been wanting to try this recipe when I first saw it on Pinterest. We don’t usually buy hot dogs though so it would be a once in a decade treat. This food definitely caters to the inner child in all of us. BIjoux, I’m totally a hot dog fan so I love these! I fully embrace my inner child. Tee hee…these make me giggle for some reason. What a fun meal! Thanks amanda, totally silly indeed! Halloween crazyness here as welle, but I don’t think I ‘ve seen anything similar!!! Sefani, so glad it was well enjoyed!! Hooray! !